Modern Mediterranean in Midtown with a locavore bent. 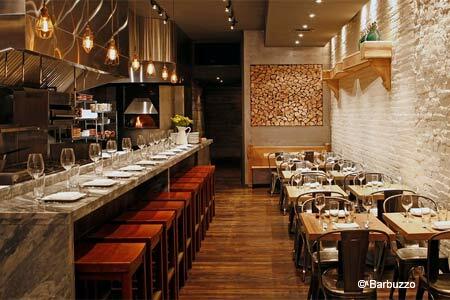 : At Barbuzzo, the modern Mediterranean restaurant in Midtown Village, chef/co-owner Marcie Turney doesn’t just proclaim a locavore bent: a chalkboard is updated daily with specific vegetable, fruit and dairy products. All are sourced from farms in Chester and Lancaster counties, verdant spots including Green Meadow and Blue Moon Acres. The seasonal menu might list spring pea and mushroom arancini, shaved asparagus and speck salad or a roasted and raw salad with beets, goat cheese and pistachio pesto. From the oven come some of the city's best margherita pizzas, as well as pies with innovative combinations such as Brussels sprout leaves, guanciale, "secret" white sauce and truffled farm eggs. Pan-seared gnocchi with heirloom cherry tomatoes and truffle butter, and the tonnarelli with calamari, lemon and olives are standouts among the pasta dishes. For dessert, try the house Italian pudding --- chocolate-crusted salted caramel budino.